For the Angels collection we wanted to spread our wings and try a collection focusing on these beautiful celestial beings. In this collection you will find angels playing the horn, wearing strings of flowers, praying and much more. We used an off white base fabric and off white or beige appliqué combined with neutral tones of thread to gives these angels a truly angelic look. 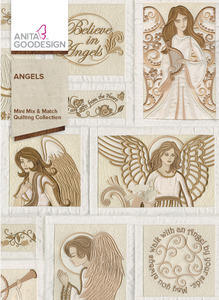 The angels are made up of appliqué or fill stitches, giving them each a unique look. 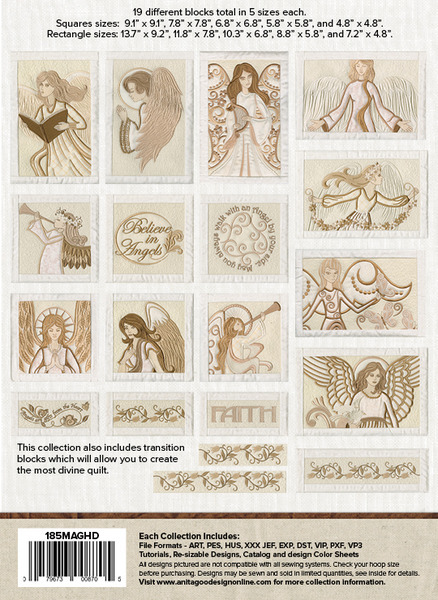 This collection also includes transition blocks, which will allow you to create the most divine quilt.